APG Series 100: 16195 - 16" W x 19.5" D x 4.9" H, 320 MultiPRO Interface, Caddy System Cash Drawer, Flat Cap, Media Storage, requires cable. Color: black. 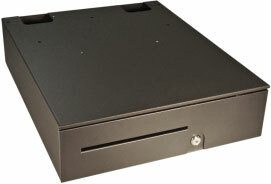 The APG INT320-BL16195-F is also known as APG Cash Drawer	APG-INT320-BL16195-F	or INT320BL16195F	.